Katie Price was today banned from getting behind the wheel for three months after she admitted driving while disqualified and without insurance. The 40-year-old former glamour model was also fined £1,100 after she was spotted driving on the A24 near her West Sussex home on July 25 while a six-month driving ban was still in place. She pleaded with the court not to ban her again, saying she needed her car to visit her terminally ill mother Amy and ferry her son Harvey, who has various conditions including Prader–Willi syndrome, to hospital appointments. A bodyguard arrived at the court earlier in the morning and asked staff which were the best exits to avoid publicity, but were told there was only one way in and out for everyone, it is understood. When she arrived, Price was ushered through security flanked by two minders and several advisers but none were subjected to the normal checks. They were directed to one nearby but the usher apologised, saying: ‘I’m sorry but it has full windows’ – to explain that it overlooked the front of the building. After the case got underway, Crawley Magistrates’ Court heard Price had driven back from the short stay car park at Gatwick Airport to Dial Post, a hamlet near Horsham, after travelling by train into London to take her son to a medical appointment. Could Price be back in front of a judge after filming inside court? 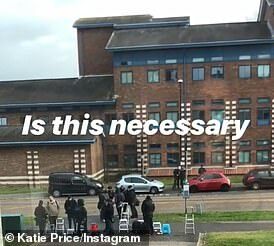 Katie Price could narrowly avoid further trouble at court today after she posted a video on Instagram which was taken inside the court building. The short clip, which was taken through a window and showed around 15 photographers and reporters gathered outside on the street, was captioned: ‘Is this necessary’. It is illegal for someone to capture or publish any photographs taken inside a court building under section 41 of the Criminal Justice Act 1925 – with the penalty on summary conviction a fine of up to £1,000. But it is likely that Price will avoid prosecution because the law specifically bans taking pictures of ‘a party to any proceedings before the court’ – which probably will not cover members of the media outside. It comes one day after barrister Robert Mochrie, from the 39 Park Square chambers in Leeds, risked the wrath of a judge after sharing a picture of Paul Gascoigne wearing his wig from inside Teesside Crown Court. 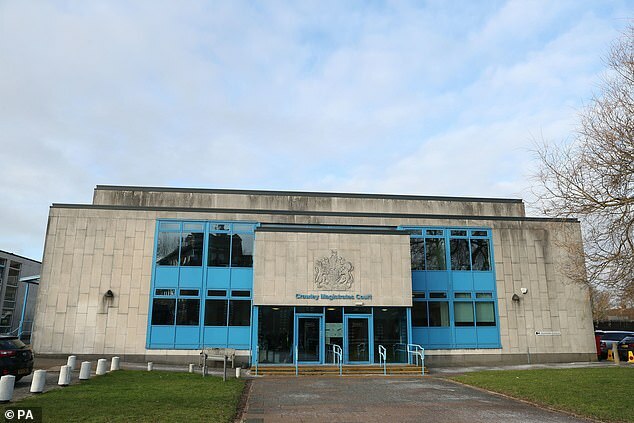 The mother-of-five made the discovery of her wrongdoing after being phoned by a newspaper informing her she had breached her ban – which was later confirmed with police, magistrates were told. She was banned from driving for six months in February but she was said to have mistakenly believed the ban had been imposed from an earlier hearing in January. This meant it would have ended in early July, before she got behind the wheel. But Price had not contacted the DVLA about reinstating her driving licence because she was ‘not the best’ at paperwork, Paul Macaulay, defending, told the court. Mr McCauley added: ‘Her son has numerous medical difficulties. ‘Her mother has a lung disease which causes life expectancy to be now less than three years. The address she lives is in the middle of nowhere. Arriving in a black Mercedes saloon car, she wore a brown fur Cossack-style hat and matching poncho with black leggings and sunglasses flanked by two bodyguards. Price – who was also accompanied by several advisors – removed her hat before entering the court room with her lawyer, who carried a large brown bag for her. Standing in the dock this morning, she spoke only to confirm her name, date of birth and address before sitting down to listen to the proceedings. Magistrate Serena Stewart said: ‘We have taken account of your early guilty plea and means form. We are going to fine you £1,100. Fans of Katie Price shouted words of support to the television star as she arrived at court, and berated the press for covering the case. Women gathered outside Crawley Magistrates’ Court shouted greetings to the former glamour model and heckled the pack of reporters and photographers. Some even tried to approach her legal team and ask if they would also represent them. But other bystanders criticised Price’s behaviour, claiming she was getting preferential treatment to other defendants. A bodyguard arrived at the building earlier in the morning and asked court staff which were the best exits to use to avoid publicity, but were told there was only one way in and out for everyone, it is understood. One of her entourage was reprimanded by the magistrates after a phone went off loudly during the case. Minders parked a black saloon car on double yellow lines outside the court as they waited for her to leave the building. A traffic enforcement officer from Crawley Borough Council stood beside the vehicle, monitoring it until it drove away. Afterwards he said the car’s details had been ‘logged’ but could not confirm if this would result in a parking ticket as they have to allow a five-minute grace period for vehicles parking on double yellow lines. He said the amount of interest in the court case had prompted a deluge of cars parking illegally outside but suggested no action would be taken as there were too many to process. After banning her from driving for three months, the magistrate asked her if she understood. ‘Yep,’ the glamour model said. The ban will end on April 8. Price asked when she should apply to have her licence back, saying: ‘When is that?’ She was told to contact the DVLA a couple of weeks before the end of her new ban. Price said ‘thank you’ to the magistrates as she left the courtroom. She did not respond when reporters outside the building asked if she had any comment to make. Today’s appearance was the second time Price has attended court in three days. It comes after she pleaded not guilty on Monday to drink-driving after allegedly crashing her £75,000 Range Rover into a parked car while twice the legal limit. 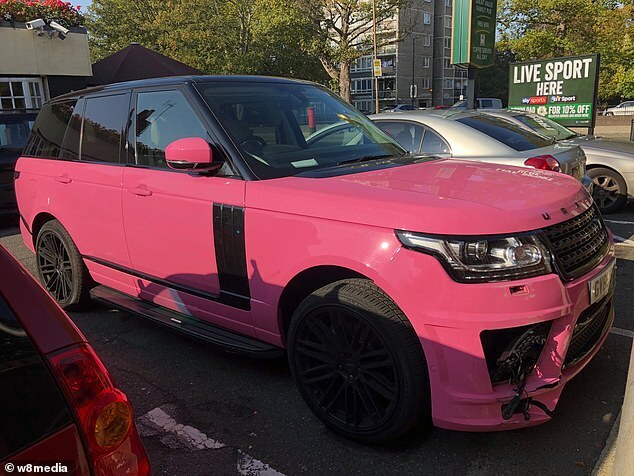 Price’s pink 4×4 smashed into a car and a hedge in South East London following her ex-boyfriend’s birthday party in the early hours of October 10 last year. On Monday, Price, who is accused of being drunk in charge of a motor vehicle last year, appeared at Bromley Magistrates’ Court. The court heard on Monday that when she was breathalysed she had 69 micrograms of alcohol in 100ml of breath. The legal limit is 35mg per 100ml. She initially refused to give her address in court, but District Judge Nigel Dean ignored her request, and scolded her by saying ‘all defendants are treated equally’. The judge granted Price bail until her next appearance. She will next appear at Bexley Magistrates’ Court on February 25 for her trial. Price, formerly known as Jordan, has tied the knot three times and has been in the headlines following the collapse of her most recent marriage to Kieran Hayler. She also recently revealed her mother Amy Price has been diagnosed with idiopathic pulmonary fibrosis (IPF) – the same disease that killed Keith Chegwin. The I’m A Celebrity… Get Me Out Of Here! star was once worth about £45million, but she avoided being made bankrupt last month after reaching a deal with creditors. In recent months there have been reports that the former model, a keen horse rider, had been trying to sell off her pink horsebox and a number of her animals. Her £2million mansion, a former home of politician Francis Maude, boasts nine bedrooms, a two bedroom annexe, 12 acres of land, a pool, tennis court and stables. She bought it for £1.35million in October 2014, but it has since fallen into a state of disrepair, with the grounds strewn with rubbish and the pool full of dirty water.